Thermogram Assessment Services performs gold-standard interpretations of breast, atherosclerosis, carotid and thyroid thermography examinations. It also sells thermal imaging systems and software. TAS's pioneering work in thermography and its adherence to international standards have always set it apart from other interpretation services. 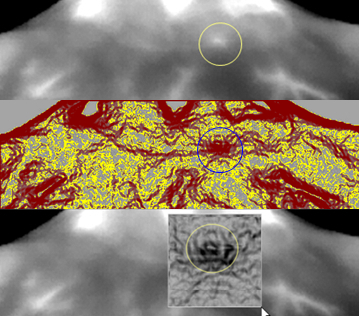 Now, TAS ushers in a new era of non-invasive imaging by introducing Spatial Thermographic Imaging, a technique that virtually strips away tissue to visualize subcutaneous thermal sources. Blood vessels, organs, benign sources and metabolic processes all radiate heat. A portion of the radiated heat flows to the skin and forms a stable thermal pattern directly related to the heat transferred from these subcutaneous thermal sources. Special, high precision heat-sensitive cameras digitally record these surface temperature patterns in images called thermograms. Thermography successfully derives symptomatology using statistical analysis and subjective interpretation of surface thermal artifacts to interpret the thermal patterns. Recent advances in infrared camera technology have significantly improved image quality and precision. These enhancements led TAS to posit, and later confirm the existence of significant additional information in the image, beyond that which relates to the basic structure and macro-characteristics of the thermal patterns. Now, after three years of development and successfully testing its discovery, TAS is publicly introducing Spatial Thermographic Imaging (STI), a proprietary thermographic method of visualizing organs and physiological functions beneath the skin. STI is an advanced mathematical digital technique that in essence, recreates a visualization of the thermal sources forming the patterns captured in a conventional thermogram. Spatial Thermographic Imaging virtually peels away tissue to 'see' what lies beneath. The conventional thermal image above is a typical breast thermogram showing almost no hint of dysfunction. But, both the MRI and the STI-processed image reveal three tumors, each with astonishing clarity. This conventional thermogram is a typical medium-resolution (320px X 240px), grayscale image of a reported-asymptomatic breast. (White is hot; Black is cold.) The risk of breast disorder is calculated based on the presence of up to twenty-two observed statistically significant 'thermal signs.' 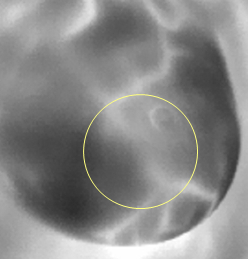 This image shows only two such signs - an irregular prominent surface vessel and a cool area (circled) generally of minor importance. Conventional interpretation finds this breast examination equivocal and the breast at borderline risk for development of breast cancer. But, STI discloses a much different scenario. In this specific case, STI reveals multiple suspicious masses beneath the observed cool region, which leads to a different finding. Instead of an equivocal finding with borderline risk, the breast is found to be 'intensely abnormal' and at very high risk for development of breast cancer. The STI shallow-depth image (2) depicts the conventional thermogram processed with STI technology and visualizes slightly below the skin surface. Note the area under the circled cool region, on the prominent vessel. It appears shrouded with convoluted vascular congestion, consistent with the appearance of neoangiogenesis. This revelation alone serves to elevate the examination findings to intensely abnormal from equivocal. Breast thermography is only one of many purposes where STI is a useful adjunct to the thermographic image evaluation and interpretation process. TAS also interprets the ThermEval ACT Examination, which assists in identifying subclinical signs suggesting the presence of coronary artery atherosclerosis, carotid artery disease, and thyroid dysfunction. The following images demonstrate the application of STI to capture signs of a previously undetected carotid artery disorder. This patient experienced frequent TIA episodes. Standard carotid (ultrasonic) studies were negative for carotid stenosis or occlusion. A routine ACT Examination indicated a left-side, external-carotid disorder. The false-colored, thermograms of the patient confirmed an interruption of vascular flow through the left carotid artery (circled). As the carotid arteries are situated close to the surface of the neck, shallow-depth STI is adequate for imaging. The center image discloses an abnormality, and the magnified, detailed image reveals the likely cause of diminished flow. A conventional thermogram highlights an elevated temperature over the thyroid left, but offers no insight as to its cause. This center image is STI combined with isotherm highlight to illustrate the substantial, extended involvement resulting from the unknown malady. An STI magnified view reveals suspicious nodules as the possible cause of the elevated region. Further, comprehensive examination confirmed three benign cysts. The preceding examples illustrate the utility of STI in specific disciplines currently interpreted by Thermogram Assessment Services. Here, STI has proven to be an indispensable adjunct and contributor to the accuracy of interpreting breast, atherosclerosis, carotid and thyroid thermographic examinations.